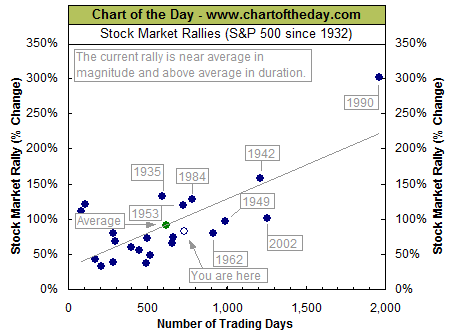 "With the S&P 500 trading above 2,000 for the first time in history, today's chart provides some perspective to current rally by plotting all major S&P 500 rallies of the last 82 years. With the S&P 500 up 91% since its October 2011 lows (the 2011 correction resulted in a significant 19.4% decline), the current rally is slightly below average in magnitude above average in duration. In fact, of the 23 rallies plotted on today's chart, the current rally would rank 7th in duration." Could there be more upside? The Wall Street Journal has an article out today noting, "Stocks have risen in eight of the past 10 Septembers, with the lone outliers coming in 2008 (the worst of the financial crisis) and 2011 (the middle of the European debt crisis and one month after the downgrade of the U.S. credit rating)."